Chair of the Board of Tetrareal Jsc George Velchev (left) and General Manager of the Doubletree by Hilton Varna hotel Claudio Sturm (right) announce the opening of the first Doubletree hotel in Bulgaria. Photo by Anettevents. The top-class world hotel brand Hilton will be represented for the first on the Bulgarian Black Sea coast with the opening of the “Doubletree by HiltonVarna” hotel in the Golden Sands resort. The upcoming opening of the Doubletree by HiltonVarna was made public Friday at a news conference in the Golden Sands with the announcement of the signing of a franchising contract between Hilton Worldwide and Helios Hotels Jsc, a subsidiary of Tetrareal Jsc. The famous Doubletree chocolate chip cookie, an icon of the hospitality of the brand, was introduced for the first time in Bulgaria at a special ceremony. While the top global luxury hotel brands ar present in Sofia, the Doubletree by HiltonVarna will be the first establishment of such class in Bulgaria outside of the capital. “The new Doubletree by HiltonVarna is the fully renovated luxury part of the former Helios Spa & Resort Hotel. We have decided to perfect this part in order re-brand it, so we have invested in a number of improvements such as new fire and safety installations, new TV systems, or the Suite Dreams mattresses which are a must for the Doubletree brand, and are unique for Bulgaria in our hotel,” announced Dr. George Velchev, Chair of the Board of Directors of Tetrareal Jsc. “Our company has made a considerable investment in Doubletree by HiltonVarna, especially given the fact that the hotel already had a five-star category. Our aim was to create a unique product for the Golden Sands and the Bulgarian Black Sea coast. We are glad that once again we will be pioneers with our world-class brand and services in the Golden Sandsresorts. Hilton has been selected many times as the most famous hotel brand in Europe and the world, and I am convinced that this product will enjoy an immediate success here since Bulgaria continues to offer the best quality at the best price among the European vacation destinations,” Velchev explained. While not allowed by the Hilton franchising contract to disclose the precise figure of the investment in the new Doubletree hotel, Velchev told Novinite.com (Sofia News Agency) that the amount of money invested to re-brand the hotel was about 35% of the original investment for its construction. 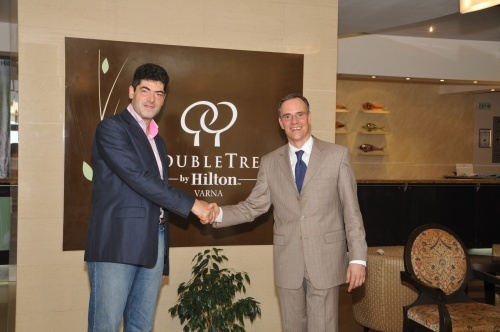 “The opening of Doubletree by HiltonVarna in 2010 reaffirms the stable development of the Doubletree brand in Europe. The European presence of the world hotel brand Doubletree by Hilton has marked considerable growth in the last few years,” said Claudio Sturm, the General Manager of the new Doubletree by HiltonVarna hotel in the Golden Sandsresorts. Sturm has prior experience at management positions in leading hotel chains in Germany and Austria, and has also served as the Sales and Marketing Director of the Hilton Sofia. Doubletree by HiltonVarna is located in a green area of the Golden Sands resort with a sea view. It features a fitness center equipped by top American producer Precor. It offers a direct access to the Aphrodite Beauty Spa & Health Clinic, a unique combination for the Bulgarian Black Sea coast of a spa and medical center located on a total of area of 2 300 square meters. Among its many other amenities in the Doubletree style, the hotel grants its guests a free access to its own section of the beach at the Golden Sands resort. Doubletree is one of the ten brands in the Hilton Family which also participates in the Hilton Hhonors program; it encompasses facilities in 230 locations around the world. The first Bulgarian Doubletree hopes to profit from the loyalty of Hilton clients, as well as from the upcoming opening of a number of new Doubletree hotels around Europe – 4 in Russia, 3 in Turkey, and one in each Greece, Romania, and Norway. Velchev told Novinite.com (Sofia News Agency) he expected that the opening of the Doubletree by Hotel Varna hotel will break the model of the Bulgarian Black Sea hotels and resorts of reliance on tour operators for clients. In his words, over 90% of the foreign tourists at the Bulgarian Black Sea hotels are recruited through tour operators; while with specific features of the Doubletree brand will allow the new hotel to bring this number down to 20%-30% as far as its guests are concerned. Velchev has also announced the planned opening of another facility of the Hilton brand by his company - the HiltonVarna. Its construction will start after the demolition of an existing hotel in the Golden Sandsresorts in the fall of 2010, and the HiltonVarna is expected to be opened in June 2011. Interviews with the Chair of the Board of Tetrareal Jsc, George Velchev, and the General Manager of the Doubletree by HiltonVarna, as well as additional information expect on the Novinite.com website on Monday and in The Sofia Morning News on Tuesday.